Looks like Liberal Democrat opposition leader on Lambeth Council, Ashley Lumsden, hasn’t updated his ‘Friends Reunited’ profile for a while. The councillor – who is not known for his modesty – is still claiming to be running Lambeth Council two years after voters booted him and his party out of office in a landslide defeat. 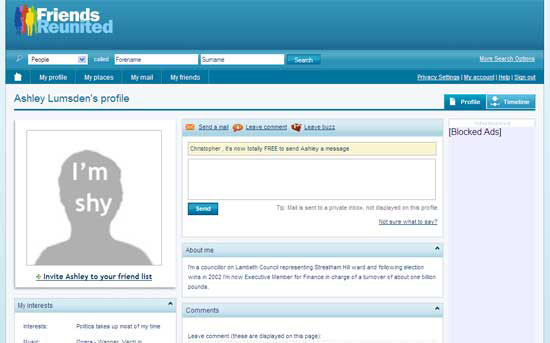 Lumsden, who updated his profile just hours after winning election in 2002, tells the world that he’s “a councillor on Lambeth Council representing Streatham Hill ward”. So far, so good. He continues: “following election wins in 2002 I’m now Executive Member for Finance in charge of a turnover of about one billion pounds.” Well, there’s one in the eye for all those other schoolboys who gave Ashley such a rough time of it at school in Surrey! Quick though he was to boast about his newfound importance in 2002, Lumsden neglects to tell his old school chums how after putting council tax up 40% and losing £3 million in the biggest housing fraud case in British local government history, his cunning election strategy led the Liberal Democrats to their biggest defeat in the country in 2006. Still, no point giving those rough boys from school any more ammunition, is there?